Local artist and travel writer Henry Thornhill Timmins (1902-83) F.R.G.S. 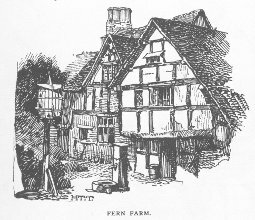 published Nooks and Corners of Herefordshire in 1892 as one of a short series of pocket county guides. He was born in Birmingham on January 4th 1856 and died in Rome on 4th February 1908 and is buried in the Protestant Cemetery at Testaccio in Rome. Retracing our steps through deep and shady lanes, anon across meadows sweet-scented with clover, where the invisible corncrake reiterates its rasping cry, we shape our course through the little hamlet of Munsley, near to the weed-grown channel of the now disused Hereford and Gloucester canal; and diverge from our course down a rough and barely distinguishable bye-lane, which brings us to Fern Farm, a remote and picturesque old homestead lying on the road to nowhere; whose deep-browed roofs, ancient weather-stained timbers, ivy-clad gables and pigeon-cot improvised from a disused barrel, form a ‘bit’ to make glad the heart of the sketcher. Slight remnants of the once ‘fayre palace’ may be traced in two sharply-pointed stone arches and inner wooden arch of the Gate-house, and the oak roof of the refectory now in the adjoining farmhouse. There stood till recently an ancient dovecot, probably at least as old as the thirteenth century, which was unhappily destroyed a few years ago, thus leaving another gap in the record of these curious, fast- disappearing relics of mediaeval times. 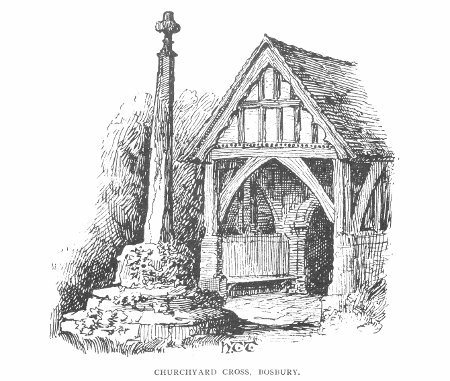 The fine old church has a massive detached tower, standing a considerable distance from the edifice, a large half-timbered porch having the Norman pillar inside curiously cutaway to make room for the holy-water stoup; and the ancient churchyard cross, spared by the Covenanters upon the rector undertaking to place upon it the words, ‘Honor not the >|<, but honor God for Christ,’ which may still, though not without difficulty, be deciphered. Inside the church we are attracted by several notable features; the pretty chapel erected by Sir Rowland Moreton to the memory of his wife, with quaint rebus, M on a tun, carved on the bosses; the graceful rood-screen with fan-tracery; recumbent effigies of the Harford family in the chancel; and, lastly, a very ancient font, probably of the eighth or ninth century, which was found beneath the pavement during some alterations. The long village street, though retaining no features suggestive of its former dignity, makes a pretty picture with the homely gables of these ‘abodes of ancient peace’ looking out upon the tree-begirt churchyard over the way, where the sturdy tower is reputed to have been used as a place of refuge in the troublous days of old. Quite at the far end, scarce visible in our sketch, stands the wayside inn, con- taining, in a fine old wainscoted hall known as the Crown Room, some traces of the ancient mansion of the Harford family, whose monuments we have already discovered in the church. This fine apartment is of considerable size, with wide stone-mullioned window. The fireplace is surrounded with old blue Dutch tiles, and over it, in handsomely-carved panels, appear the arms of the families of Wrottes- ley, Scrope and Fox, and the date 1571. A frieze of delicate carving runs around, and at the crossing of the massive beams in the ceiling three bosses show respectively the bearings of Bishop Skipp, the arms of Scrope, and of Powlett first Marquis of Westminster, having the garter and coronet.